Some of the most challenging calls we get are those involving ocean or water rescue. Because of the unpredictablilty of ocean conditions, our volunteers must be familiar with our coastal waters, and often need to swim, operate a jet ski and/or a motor boat in addition to having to carry medical equipment in order to bring those requiring rescue to safety. 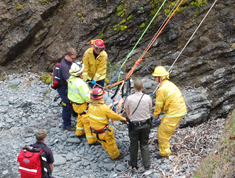 Cliff rescues present no easier challenge, and the procedure for rescue is practiced many times to be prepared for a real emergency. Visitors to the coast are often uneducated about cliffs and tides, and are grateful to see the specialized team and equipment that will bring them to safety when they are in a predicament. 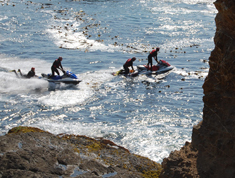 Jet skis are quickly able to reach someone in distress. 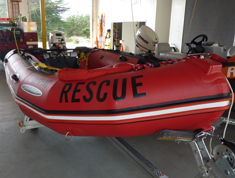 One of two rescue boats ready to put in when the need arises. The team readies the rescuee to be lifted to the top of the cliff. Such specialized skills add to the Mendocino Volunteer Fire Depart-ment's reputation as one of the best, and our crew rivals those of many a paid fire department.